MOULIK RUBBER INDUSTRIES, is one of the prominent name for manufacturing of maintenance free, leak proof & high quality rubber components.We are a team of qualified and skillful professionals, providing our services into a diverse range of industrial segments since 1990 as O.E manufacturers. We are recognized for our excellent service, competitive rates & precision quality control, which helps us to achieve complete customer satisfaction. We are an SSI registered company with an ISO 9001-2015 certification by M/S.Bureau Veritas Certification India PVT. Ltd.We have state-of-the-art machineries for in-house molding & extrusion process, and all sorts of Grinding and Polishing Machines along with accurately calibrated testing instruments. We undertake jobs for Precision Rubber moulded parts such as ‘O’ Rings, Oil seals, U & V Seals for Hydraulics, Pumps, Chemical and Mechanical Seals, Diaphragms for Actuators, Pneumatic control & Saunders Valves, Bellows, Gaskets, Washers, Bush, Vibration mountings, Metal‐Rubber Bonded products and Extruded profiles such as Strips, Sleeves, and Cords. 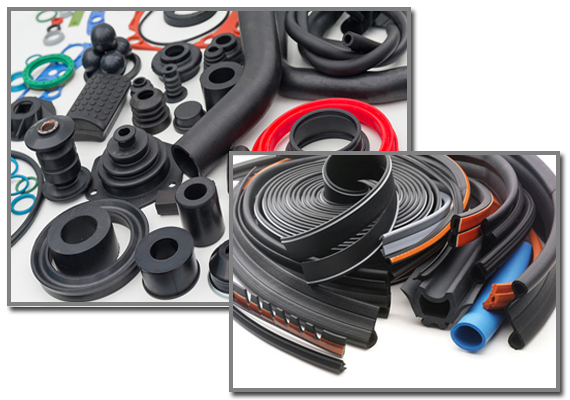 We can also manufacture rubber products as per Customer’s drawings, standard specifications and Samples from variety of Imported Synthetic Rubber grades like Viton® fluoroelastomer, Neoprene,Nitrile, HNBR, E.P.D.M., Silicone, Polyurethane and also Natural Rubber. BEING ON PAR WITH QUALITY & PRICE ONLY GETS YOU IN THE GAME. BUT "SERVICE" WINS THE GAME.